This is the Icelandic paperback edition of Fly on the Wall. This edition was published Frjals Fjolmidlun in Reykjavik, Iceland. 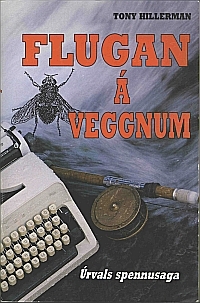 Tony Hillerman: | FLUGAN Á VEGGNUM | þýðandi: Ragnar Hauksson | Útgefandi: [publisher's logo] ÚRVALSBÆKUR | FRJÁLS FJÖLMIDLUN HF., | Reykjavík 1990. Binding: Heavy paper printed in full color on the front, and dark aqua on the back.